Who is it for? MAC Fluidline Dipdown is Fluidline’s gel formula, which provides the precision of a liquid liner with a silkier, softer finish. Goes on “foolproof” with a brush in an easy dip-and-stroke action. Long-wearing. Smudge-proof. 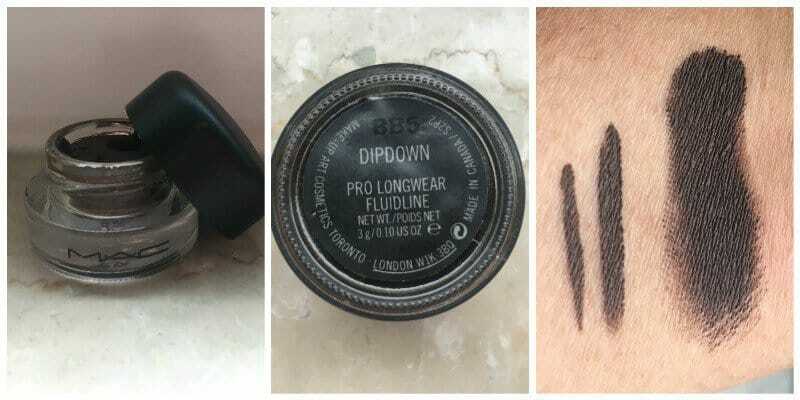 It comes in a variety of colors but today I’ll be reviewing Dipdown, which MAC describes as, Deep Dark Flat Brown. Line the lash line with Fluidline using an eyeliner brush or brow brush. The texture is really smooth and silky. It is very smooth to apply. Even after having it for a long time, I haven’t noticed any change in texture. It is quite pigmented. I love gel eyeliners as they don’t easily smudge. But this eyeliner is in a different league. It’s worth the money. Before setting, the formula gives you enough time for creating a base or for a smokey look. But once settled, it is smudge and waterproof. But it can be easily removed with oil based cleanser( not much rubbing involved). At times I use it for filling my eyebrows too. It doesn’t irritate the waterline and can be used to color the waterline. On eye last for long. Can be used as a base or for a smokey eye. Can be used to line the waterline. Even after a long time, the product doesn’t change its texture. Can be used to fill eyebrows. Can be blended immediately after application. Yes definitely. It’s one of the best gel eyeliner and totally worth the money. MAC Liquid EyeLiner Pen – Is it Worth Your Money ? ?